China and other emerging donors are fundamentally changing the development finance landscape; however, many of these actors do not participate in existing global reporting systems, such as the OECD’s Creditor Reporting System and the International Aid Transparency Initiative. AidData employs a range of different methodologies and technologies to fill these critical information gaps and help those who seek to understand the nature, distribution, and effects of development finance from these influential actors. Non-Western suppliers of international development finance that are outside the OECD’s Development Assistance Committee (DAC) – often identified as non-DAC donors – play an increasingly important role. Estimates of official development assistance (ODA) from non-DAC sources vary widely from $11 billion to $41.7 billion per year. Countries such as China, India, and Saudi Arabia are often called ‘Emerging Donors,’ but many of these countries have provided international development finance for more than 30 years. Additionally, many non-Western suppliers of international development finance are finding new ways of supporting partner countries that go beyond the traditional, ODA grants and concessional loans. AidData has developed new methodologies to capture South-South cooperation activities and other non-DAC sources of development finance activities in a reliable and systematic manner. To date, we have collated, cleaned, standardized, and published official data from 38 non-DAC bilateral and multilateral institutions (find these on our Datasets). 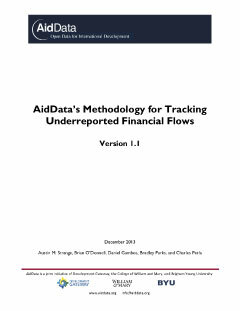 AidData has pioneered the creation of an innovative, open-source methodology to provide a more complete picture of non-DAC development finance activities. AidData's Tracking Underreported Financial Flows (TUFF) methodology provides a systematic, transparent and replicable way of tracking aid and other forms of state financing from non-Western governments—such as China, Saudi Arabia, and Qatar—that do not publish comprehensive or detailed information about their overseas activities. TUFF synthesizes and standardizes vast amounts of unstructured, project-level information from governments, international organizations, civil society groups, the private sector, journalists, and researchers. 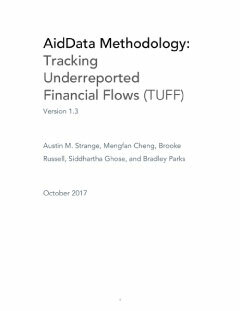 Initially created to track Chinese development finance to Africa, AidData is now applying the TUFF methodology to better understand the activities of both non-DAC and DAC development partners (when there is incomplete information in public domain). TUFF-based data is currently available for China, Saudi Arabia, and Qatar. AidData’s Global Chinese Official Finance Dataset pulls back the curtain on China’s overseas development program, capturing more than USD $350 billion in foreign aid and other forms of state financing that China committed to five major regions of the world from 2000-2014. Covering more than 4,300 projects in 140 countries and territories, this is the most comprehensive and detailed source of information on China’s global development footprint ever assembled. For more information on this data collection effort and analysis, view an overview of the data by the numbers and the related working paper. For questions or concerns, please contact china@aiddata.org. Potential projects are identified through extensive searching of official sources and media reports. Projects undertaken in a particular country and supported by a specific supplier of official finance—be it a sovereign government, multilateral institution, non-governmental organization, or private foundation—are identified through four major sources: (1) aid information management systems (AIMS) in recipient countries; (2) Embassy and Economic and Commercial Counselor websites; (3) IMF staff country reports; and (4) Factiva, a Dow Jones-owned media database that draws on approximately 33,000 media outlets worldwide in 23 languages, most of which are newspapers, radio and television transcripts. Additional sources for each project identified in Stage One are searched for and synthesized. Research assistants use Google and other search engines, such as Baidu, to confirm or refute a project’s existence and refine the accuracy of a project record. These searches uncover critical details on the project, such as: the financing agencies, the donor’s financial contribution, and the status of the project. During these searches, research assistants can uncover additional sources, including: (a) media reports; (b) other donor or recipient government documents, like loan agreements, budget documents, or project documentation; (c) country reports published by the IMF, World Bank, the African Development Bank, the Asian Development Bank, and other intergovernmental organizations; (d) information from the websites of contractors responsible for implementing officially-financed projects; (e) multimedia evidence of project activities, like photos and videos; (f) field reports published by in-country NGOs; and (g) academic articles. If any additional projects are identified from these new sources, such projects revert to Stage One before they undergo the source triangulation process in Stage Two. Information gaps can additionally be corrected via correspondence with donor and recipient agency personnel. A series of rigorous, systematic quality assurance procedures are applied. Using open source information has many potential pitfalls, and we seek to identify and eliminate potential errors, biases, and data gaps. This quality assurance includes the following procedures: (1) identifying and eliminating duplicate records through a thorough recipient-sector review process; (2) reducing double counting by separately identifying umbrella projects and their subsidiary activities; (3) checking the consistency of project categorizations at the record level; (4) careful review of every record by a senior research assistant or program manager; (5) targeted review of high-value projects; and (5) currency exchange and deflation calculation. As a last step, the data are vetted by a large network of internal and external reviewers to identify potential errors or missing data. It is our hope that through the protocols and processes of the TUFF methodology, we can minimize errors, biases, and gaps and produce the most consistent, complete and replicable dataset possible. That being said, all open source data collection initiatives like this one are subject to limitations and biases (e.g., Muchapondwa et al. 2016). As such, the interactive platform available at china.aiddata.org is designed to facilitate the collection of feedback from a distributed network of users who may possess valuable information about relevant projects and financial transfers. Users who have knowledge of any additional projects or information to update any existing projects can “suggest a project”, “confirm”, “challenge”, or “comment” on any project on the china.aiddata.org platform. Once program managers at AidData receive these notifications, they seek to vet and verify the information, and, when appropriate, revise project records on the basis of credible information provided by external parties. AidData has also used the TUFF methodology to track two donors in the Middle East: Saudi Arabia and Qatar. Gulf donors are some of the most generous donors in the world, with both Saudi Arabia and Qatar giving over 0.7% of GNI in 2013, yet few details are known about these flows. 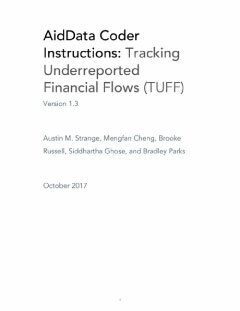 AidData’s TUFF-based data collection activities have revealed more than 300 Official Development Assistance (ODA) and Other Official Finance (OOF) projects from Saudi Arabia and Qatar between 2010-2013, totaling over $52 billion combined. Currently, our data only systematically cover 13+ recipients, but we are continually adding additional recipients and years. 1. Global Standards Reporting: For non-DAC development agencies that already store and organize project- or activity-level information in an internal database, we work with these institutions to standardize their data and align with global reporting standards. AidData has a ten year track record of “cross-walking” the databases and information repositories of individual development agencies to global reporting standards and databases. 2. Standardizing Data: For non-DAC development agencies that possess project- or activity-level information not yet stored in a single data repository, we help them digitize, standardize, and publish project-level information contained in long- form project documents, online web pages, or similar formats. Using Optical Character Recognition (OCR) technology and various web-scraping tools, AidData digitizes, catalogues, and publishes donor information previously locked in physical project documents and annual reports or in stand-alone websites. In total, AidData has standardized and published data using these methods for over 30 donors, including South Africa, India, and many other non-DAC donors. 3. API and Technical Service Delivery: We build intuitive application programming interfaces (APIs) to help non-DAC development agencies export their data in ways that are accessible, useful, and consistent with international standards. AidData’s highly-trained team of information technology experts help development finance institutions publish their existing project-level data through an API, enabling this data to be easily searched and exported to the user’s requirements. 4. Train the Trainers: We offer training and capacity building opportunities to help non-DAC development agency personnel to more effectively capture, report, publish, visualize, and analyze project-level data. AidData staff can conduct a “needs assessment” for a development agency to assess existing systems and make recommendations for how data collection, categorization, and reporting can be made compatible with global standards. To strengthen institutional capacity to build and maintain standardized reporting systems, AidData can either host development finance personnel for a rotation at our offices in Washington D.C. or Williamsburg, Virginia. Training modules include: (a) data management and quality assurance; (b) sustainable reporting systems and international best practices; and (c) geocoding and geospatial analysis of aid. 5. Geo-locate Activity Locations: We work in close partnership with development agencies to pinpoint the precise physical locations of development cooperation projects – a process called subnational geocoding – and make this geographic information useful for in-country targeting and coordination efforts. Geocoded investment data is the basic building block for mapping the spatial distribution and impact of aid. Maps and analytic dashboards overlay project data with socio-economic indicators, such as poverty and malnutrition rates, visualizing where funds are going at a subnational level compared to areas of greatest need and opportunity.